The World lets you know that the joy which results from “truth” and the belief which results from joy are the keys which open the door to understanding the world as a work of art. Understanding – a freedom and rapture beyond words – the unconscious known consciously as the outer self is unified with the forces of life. Knowledge that is not knowledge, but rather a constant ecstatic dance of being – all true and yet not true. True unity lies in movement. Joy is harmony in rhythm – suffering is disharmony. Life is a continuous process of “becoming”. You are free to go in any direction – live your dream and you will be triumphant in any undertaking. You are free to choose your own path at last, for you have learned your lessons well. Vibrations are good for any changes you wish to make. You can accept new responsibilities and make others happy too, for you have gained insight, have applied yourself well and it is now within your power to make important decisions – others will rely on you. Never forget what it took to get you here – your consciousness is now ready to reach a higher level. Implement new plans, the chances for success are high – growth, protection, talent, charm and luck prevail. The Greater You is now ready to proceed. Affirm yourself as simultaneously real both in the flesh and in other dimensions and you will become aware of the existence of the super – conscious mind. Your experiences will dissolve any conflicts so that you can spontaneously dance through the ever-changing beliefs and their realities. Recognition of this state helps you direct energies from other dimensions into your daily life and allows you to assist in the great expansion of all consciousness. Your energy is constantly flowing, transformed and renewed as you experience love and healing, radiating wholeness to everyone – even those who are not consciously aware of it. Because of the divinity within you – your very presence communicates the loving truth to those around you. Satisfaction, achievement and success – the unification of your “inner” being with your outer activities. You must observe the vows of obedience, poverty and chastity. A chaste mind seeks the truth – not the joy of revelation of the truth. A chaste love seeks union with the loved one – not the carnal pleasure of the union. A chaste mind is sober – it is not swept away by the sweet allure of a mirage. The poor mind seeks only what is essential to the life of the body, the life of the soul and the life of the spirit and an obedient mind is capable of recognizing the “voice of truth” – it is spiritual hearing developed by obedience. 3. The mighty: to DARE or elevate oneself with the power of an eagle. 4. The tremendous: to be SILENT with the massive and concentrated force of the bull. Worldly knowledge and attainment of your mental goals, as expressed in the maximum expectations of The Star. A well – rounded education has been achieved. The World is at your doorstep even as you are at the doorstep of the universe. This is another “anything is possible” point similar to that represented by The Magician (1), except that it is not “anything is possible” as pure potential at the beginning of beginnings, it is “anything is possible” after many tests and lessons learned. This is experimental intelligence – theories that have been proven in the laboratory of life. Wholeness. There is a full understanding of the pattern of the whole in every little piece, the holographic principles underlying our perception of reality. This is the full realization of achievement, as the mind is aware of completion of the Karmic Contract and so is justifiably and properly proud. Here, to not be proud would be to err, for the self – ego is meant to become fulfilled as self-esteem. What are you doing to free yourself from the limitations and restrictions in your life or what are you doing to work freely within them? What potential do you see in yourself? In the first position: Yours is to be a world player, an international figure, even if you never leave your home town. There are many paths to universality. You will be dedicated to large issues and resolution in the long run of metaphysical conundrums. In the second position: The world may be in front of you, but it is also behind you. You have a broad base of experience, in some cases extensive travel. This is as solid as a foundation can get. You could do your thing anywhere, succeed with any group of people. In the third position: Look up to see the image of the world to which you want to belong. You are being filled with the inspiration, the knowledge which could transform the world in man’s image, in your image, of those things which are best in you. Here then is a look at what is best in man, in you. In the fourth position: Here was an early love of adventure, as a facet of hunger for knowledge and worldly experience, a healthy desire to know what was on the other side of the fence. This may have centered around heros of mythic proportion, as you wanted to emulate their ability to get things done benefiting not just themselves but whole nations or races. In the fifth position: There is a justifiable sense of accomplishment, as you reap the rewards of success for past efforts, for having done the right things at the right time. Much of your mental Karmic Contract has been achieved and you will now put the icing on the cake. Your awareness of the bigger picture is astounding, to you as well as to others, for your pride is also humble. In the sixth position: The near future is a time for great emotional and creative expansion. Your geographical playground may actually improve, but even if you stay close to home, your emotional environment will be huge. The heart is accepting its part of the drive of mind toward universality and resolution of dualities. The barrier between self and other is coming down in heart as well as mind. In the seventh position: You are externalizing, putting more of self into the other. This has you broadening your scope of interest and involvement. But you are also internalizing, accepting, embracing more of the other into the self. This is the process wherein the ego transcends self, turning the death of the ego into rebirth. 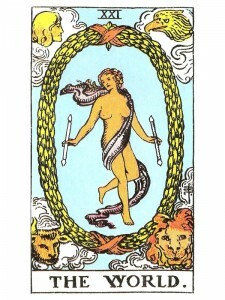 In the eighth position: Your present situation is invigorated with healthy ideas and you may feel literally on top of the world. You are centered on your personal path to fulfillment of your Karmic Contract. In the ninth position: The heart is embracing large scale goals, identifying with the agenda that includes universal mind. Heart is happy with the ego and its programs and is lending it energy for its growth and transformation into the superego of higher mind. There is enjoyment of success. In the tenth position: Look up to see your new world as it descends to become your new reality, transforming your environment into a perfect fit, a suit of armor in which you can ride forth with confidence to find your holy grail. Why is it when I know that everything I have been working towards are finally on the cusp of becoming real and will have a Powerful impact on everything and everyone in fantastic ways,why am I suddenly feeling overwhelmed? Is it because I never thought I would actually get to this point, or because I’m afraid I might make a complete hash of everything or because I never actually realised just how important my role was going to be,why am I scared now of taking that last final step ? My apologies if I’m rambling it is just that I don’t have any proper support in my life? Let me clarify – your answers are not coming from me – your own Spirit is supplying the information you need on your journey.